I love hostas!! Of all the plants I grow, hostas are definitely my favorite because they take so little care and yet they always look so spectacular all season long. (You really can’t say that about most other plants.) I now have hundreds of hostas in my gardens. Many of them are more than six feet across and really should be divided, but this will have to wait until next spring, when I will be moving many of my larger hostas to a new garden that is now still in the developmental stage. This year we have been busy moving younger hostas from their nursery beds to a more permanent location. For several years I have been interested in hybridizing hostas, and many of my hostas are ones I have started from seeds. Although it is impossible to predict what the resulting plants will look like, hybridizing can create some very striking hostas with different colors, leaf shapes, and textures. Our acid soil is perfect for growing hostas, as is our cooler climate, which gives them the dormancy period they need (about 700 hours of temperatures below 40°F). Many people think a hosta can grow only in shade, but hostas actually do very well in partial sunlight. 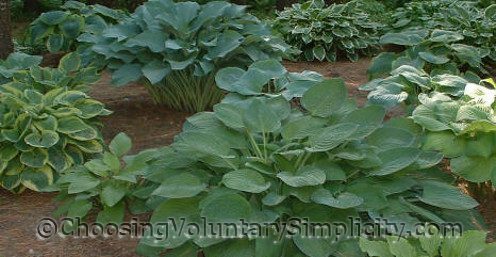 Dense shade will produce a stunted hosta with thinner and fewer leaves. 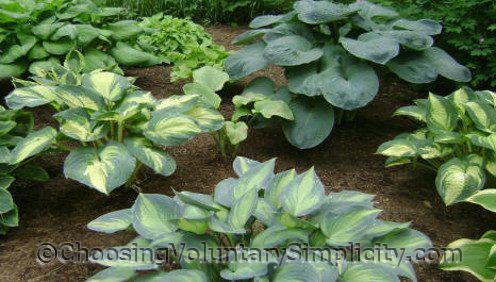 Like most other plants, hostas do best in rich organic soil with an ideal pH between 6 and 6.5. For quite a few years I have been cutting the long shoots of flowers off my very large hosta plants mainly because they hang over our side walk and people have to walk through them. Are the seeds in those flowers? Phyllis, it depends on the hosta. Some hostas produce flowers but not seeds, and some hostas produce seeds one year and not the next. If your particular hosta is going to produce seeds, you will be able to see small seed pods forming almost as soon as the flower petals fall off. The seed pods grow quickly after that. If the flowers fall off and you can’t see any sign of a seed pod where each flower used to be, your hosta is not producing any seeds this year. I just wanted to write in and say that I think your hostas and your hosta gardens look beautiful. I live in an apartment right now so I can’t have a garden any bigger than my windowbox but I am saving up for a move more into the country and one of the first things I want to do there is to start my own garden with hostas being one of the plants. You have really inspired me with your articles. I just wanted you to know that. Good to know that hostas can do well in partial sun and that they don’t need a lot of care. I just bought a HUD house at the end of May and in the weedy, overgrown, neglected flower bed in my front yard I have discovered two little hosta plants. They must be very young for it is now July and the one plant is maybe six inches high with about eight leaves on it and the other has only two leaves with a third trying to come through. I’ve put wood chip mulch around them and am keeping the area free of weeds. Perhaps with some time and TLC they will grow to be big and beautiful like yours.